Opener Callum Cook made 132 as Illingworth St Mary’s enhanced their hopes of becoming Halifax League middle section champions yesterday. Cook hit 18 fours and five sixes before being run out in the last over as Illingworth rattled up 272-4 at Queensbury. He added 119 for the second wicket with free-scoring Aussie Daniel Murfett (60). Rain reduced Queensbury’s target to 238 off 35 overs and while they couldn’t get in a blow at Illingworth’s total, Azhar Sharif’s 71 helped them to maximum batting points at 180-6. A couple of bowling points may have escaped the visitors but their 10-point return looked useful when the game between the second and third-placed teams, Great Horton Park Chapel and Bradshaw, was abandoned. It means Illingworth are 14 points clear. Matthew Jordan took 5-52 - including the wickets of Steve Beck, Simon Collins and Wayne Cotton with the total on 95 - before Connor Ryan (78) helped hosts Bradshaw rally to 197 all out. However, Chapel’s reply never got started. Clayton moved above back-pedaling Sowerby Bridge into fourth with a convincing 74-run win over those rivals away at Walton Street. Jake Dixon took 6-49 for Bridge as Clayton made 192 after a solid start from Tim Evans (39) and Paul Artist (43). Opener Tim Helliwell 43) and No 7 Paul Smith (18 no) were the only home batsmen in double figures as Mitesh Mistry (5-40) helped dismiss Bridge for 118. 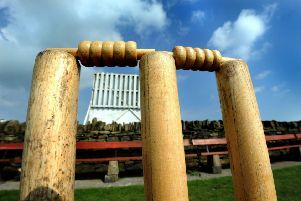 Blackley moved 21 points clear of bottom two Queensbury and Stones with a seven-wicket win away to the Ripponden side. David Peel jnr took 4-28 and after Stones’ total had been down sized from 140 to 98, Dominic Walsh’s 42 put Blackley well on the way to victory with William Thickett taking the three wickets to fall. Scores: *Bradshaw 197 (Ryan 78, Jordan 5-52), Great Horton PC dnb – abandoned rain: pts 5-5. Illingworth St Mary’s 238-4 (reduced from 272, (C Cook 132, Murfet 60), *Queensbury 180-6 (Sharif 71): pts 10-4. Clayton 192-9 (Artist 43, Dixon 6-49), *Sowerby Bridge 118 (Helliwell 43, Mistry 5-40): pts 12-3. *Stones 98 (reduced from 140, D Peel jnr 4-28), Blackley 102-3 (Walsh 42): pts 2-12. Points (after 9 games): Illingworth St Mary’s 93, Great Horton Park Chapel 79, Bradshaw 73, Clayton 72, Sowerby Bridge 67, Blackley 54, Queensbury 33, Stones 23. Mount edged in front of Luddenden Foot at the top of Division Two after the abandonment of the game between the sides at Batley. The home team made 282-9, helped by 60 from Anees Rawat and 65 from Imran Ravat after they had been 26-3. However, it started raining during the tea break and no further play was possible with Mount picking up one extra bonus point than Foot after the first half action. Upper Hopton closed the gap on the leading pair to four points with a seven-wicket win at Cullingworth. The struggling home team posted 151-8 with opener Steve Welch (47) their top scorer. Home hopes were raised when Hopton lost their second and third wickets on 59 but that was the end of the Cullingworth bowlers’ success as opener Keyur Mistry (48 no) and Jordan France (56 no) completed the task for the Mirfield side. Leymoor totalled 200, Mark Coulson hitting 56 with all but two of his runs coming from boundaries, but their home game against Outlane was washed out before their opponents could start their reply. Andrew Mitchell (54 no and 4-47) was the star man as Bradley & Colnebridge won by 57 runs at Low Moor HT, which escaped the bad weather. Mitchell’s knock sent Bradley’s total climbing to 236-8 and Moor ran into early trouble, their top three batsmen contributing only 11 between them. Brad Williamson (42) top scored in a partial recovery to 179, which left Moor just short of a third batting point. Old Town are fourth after thrashing visitors Greetland by 154 runs. Sagher Shaheen (67 no) and Sajid Mahmood (64) helped Town recover from a stuttering start to reach 216-7 and Waqas Ali (6-29) shattered Greetland for 62 in reply. Scores: *Cullingworth 151-8 (Welch 47), Upper Hopton 155-3 (France 56*, Mistry 48): pts 3-10. *Leymoor 200 (Coulson 56), Outlane dnb – abandoned rain: pts 5-5. Bradley & Colnebridge 236-8 (A Mitchell 54*) *Low Moor HT 179 (B Williamson 42, Iqbal 4-45, A Mitchell 4-47): pts 12-4. *Mount 282-9 (Ravat 65, A Rawat 60), Luddenden Foot dnb – abandoned rain: pts 5-4. *Old Town 216-7 (Shaheen 67*, Mahmood 64) Greetland 62 (Ali 6-29): pts 12-2. Points: Mount 80, Luddenden Foot 79, Upper Hopton 76, Old Town 65, Leymoor 63, Bradley & Colnebridge 58, Outlane 52, Low Moor 49, Greetland 25, Cullingworth 19.